Another Saturday and another Parkrun. So what keeps me coming back to these events? Well they’re friendly, inclusive, fun and free. And at the moment, without a definite training plan, they give me a fixed point in my week for a run. Grey and drizzly this morning, but not too cold – just my kind of running weather, so I was up and out of the house in super quick time. My legs were feeling the effects of a tough Friday morning PT session, but I hoped to put on a good run, and possibly turn it into a long one. I met my Fetch friend Lesley and her boy, Kieron, barcoded up and ready for his first Parkrun. And then as I headed to the start, I spotted Dave, who introduced me to Kate. That’s one of the nice things about Fetch Everyone – it’s like a virtual running club, and races are a good chance to catch up with your club mates. A quick warm up and stretch and we’re off away over the moor. I tried to keep it steady at the start after running some quick first kilometres in the last couple of races. Stretching out my stride to level with and pass another female runner as the field started to spread out and Dave goes past with a spot of cheery encouragement. And then, as in so many runs I found I was running a lot of this one in my own space. I pass another couple of runners out the back along Grandstand Road. I really like this stretch, probably because I’ve got into a nice pace and rhythm by this point. Back in through the gate and a quick shout from Rob who is on marshall duty and holding it open. I’m so focused on my run, it takes me a second to recognise him. There’s a very slim girl in a blue and white top and another man running well ahead and I think they’re too far away to chase down, but gradually, gradually I gain on them and go past. And now I’m approaching the point of the course I’ve found hard. The stony ground between the 3 and 4k markers always seems to unsettle me and mentally I can allow myself to drift off the pace. But today I’ve gone a bit more slowly at the start, so I want to try and keep it steady here. Ahead I spot Dave, and am surprised to see he’s walking. As I draw up behind him I ask if he’s okay and he says his calf has stiffened up. Poor guy, but he still waves me on with a smile. It’s hurting a bit now and my running feels a bit patchy, like my breathing. I’m really running on my own now and determined just to push on. The man I passed earlier catches me and goes ahead and I fight to keep my head and not let it defeat me. As I go through the last gate, I know there’s just 1km to go and back on the smoother tarmac, I try to pick up the pace a little, watching the stream of runners ahead through the mist. There’s a line of lampposts, then a turn down the home straight. You can see it coming and it never seems to get any closer. Last time I ran this, I spotted a girl just ahead and tried to sprint her down the finish. But I kicked in too early and had to reel it back. I know now, from looking at the results that she was running conservatively any way, as she’s way faster than me. This time two tall guys go past me as we turn into the home straight, but there’s a girl in a red top that I target. I pick my spot and start to increase the speed. My legs protest. This hurts, but I try to keep the pedal down. And then again. Find another gear and push on. She’s close now an I’ve closed down a lot of ground. Will she take me on in a sprint to the line? I drive on past and don’t look back, arms pumping, legs turning over really quickly now, panting for breath, but determined to keep going for the line. There’s no one to pass and I know my pace is unlikely to get me a PB, but I want to see how close I can get. Over the line in 25.36 and it takes me a good minute or two to catch my breath. Not as good as last week, but not far off my first week’s time I think. The smiley lady who has been at the finish of all my parkruns so far, and I now know is called Tuve asks how I got on, and I barely have breath to say ‘No, PB’. But I’m not disappointed. I had a good run and kept it together through that tricky 4th kilometre. Once I’ve recorded my time and position, I head back to the finish to see Dave walk across the line. Probably the only time I’ll ever pass him in a race. Despite the fact that he’s scheduled to run again tomorrow and do the Kielder marathon next weekend, he’s surprisingly relaxed about this setback, but I know he’s a bit disappointed. Get well soon Dave. I’m off to Dublin tomorrow and delivering a writing workshop on Monday, so it’s a busy weekend for me. And that meant I was unlikely to find another chance for a longer distance run. So, after the 5k race, I restarted my watch and set off around the course again at a more leisurely pace to make it a 10k. As I headed out across the moor, I spotted Lesley and Kieron heading for the finish with a run and cheered them on. And then it was just me and my thoughts in the drizzle on the moor for the next 30 minutes or so. And even though it was a much slower pace, I still don’t think my legs have quite forgiven me. Finished in 95th place and were the 11th lady out of a field of 137 parkrunners and you came 2nd in your age category. Waking early Saturday morning, my mission to make it to Parkrun number 2. It’s bright, with no sign of wind. A good day for a good run. So much milder on the moor this week, but I jog a little further to warm my legs through and spot a couple of friends from Fetch Everyone before the start. A good day for another PB? The weather says yes, but my legs are still feeling the effects of Friday’s PT session, so I’m not sure. I can actually hear the starter’s announcements this week as there’s no wind carrying the voices away. And we’re off! I don’t quite get the sensation of the whole field passing by me at the start this time. Maybe I’m a bit further back; maybe I know what to expect. I get a little blocked in behind one of the Veteran runners but manage to find a space just after the first turn and dodge the cow pats to head out onto the long straight path across the moor. Just run your own race, I tell myself, trying not to go off too fast, but targeting as close to 5 min kms as I can, with one eye on a future 10k race. Through the first km in 4:51. That’s good – stick there or thereabouts. There’s a male runner on my right shoulder and at first I think he’ll push on past, but we stay level for a while and I sense that he may be pacing himself with me. And if there’s one thing I seem to be able to do, it’s run at a fairly consistent pace. At the gate out onto Grandstand Road, he gallantly gestures me through ahead, and we continue to keep in step below the trees. We pass Hannah Bayman who I recognise from Look North and I call out ‘Keep going Hannah’ as much to check my breathing as anything else. Turn back onto the moor, dodging the muddy bits and onto the stony path and the bit of the course I don’t like as much. I start to drift a little here, pushing on, then pulling back. But my pace setter is sticking with me. I resolve to stick with him as long as I can and tell myself to relax into my stride. Just like last time, kilometre 3-4 is where it starts to slip. I can really feel my legs starting to get heavy and my breathing start to stumble and somewhere along the path, my pacer moves ahead and I cannot catch up. It’s a bit of a head down moment. A bit of a mental letting go. It’s hard to keep going as the group ahead moves off into the distance. But that’s what these short races are all about, keeping going, keeping pushing the pace and although I know I’ve dropped off a little, I try to make sure it’s not too much and hope for a sprint finish to pull it back. I look ahead to the line of lampposts marking the last section of the course and resolve to kick in when I reach a certain point. There’s a girl in a black T-shirt ahead as we approach the finish. I know I have a good kick, can I reach her? It’s a bit too fast too soon and I can’t sustain it. I kick through two more gears and close the gap, but I have to reign it in again. Oh well, just running for me and my time now. With less than 100m to go I push on for a sprint finish, hoping to be lucky and shave a few seconds off last week’s time. I collapse breathless over the line, stop the watch and collect my token. A smiley lady with blonde hair asks, “Did you do better than last week? You had a good run last week.” And I reply that I haven’t looked at my time yet, then ping up the screen on my watch to see 25:22. A new PB by 15 seconds. Get in! It’s all so effortless after that. Stand in line to get your barcode and your token scanned for your results later. Parkrun really is a well organised event. I spot my pacer in line in front and thank him for getting me round in a new PB and he thanks me for keeping my pace which he says was ‘spot on’. So, back next week? Yes please. Three PBs in a row might be asking a bit too much, but if I can eliminate the fade between 3 and 4 kms then it’s a possibility. Of course, conditions on the Town Moor can always throw the wind in your face or a cow pat under foot. But if I can book the same weather again for 14 November and the 10k race, that would be fantastic. “Your time was 25:23 . You finished in 74th place and were the 19th lady out of a field of 109 parkrunners and you came 3rd in your age category VW35-39. 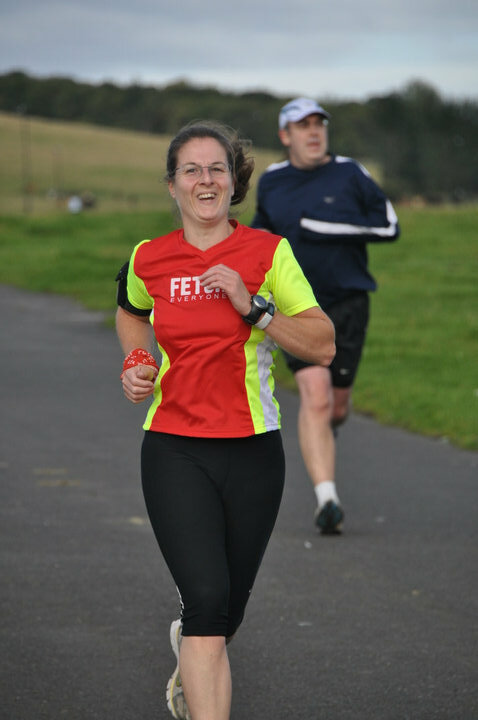 Congratulations on setting a new Personal Best by 00:14 seconds at Newcastle parkrun! 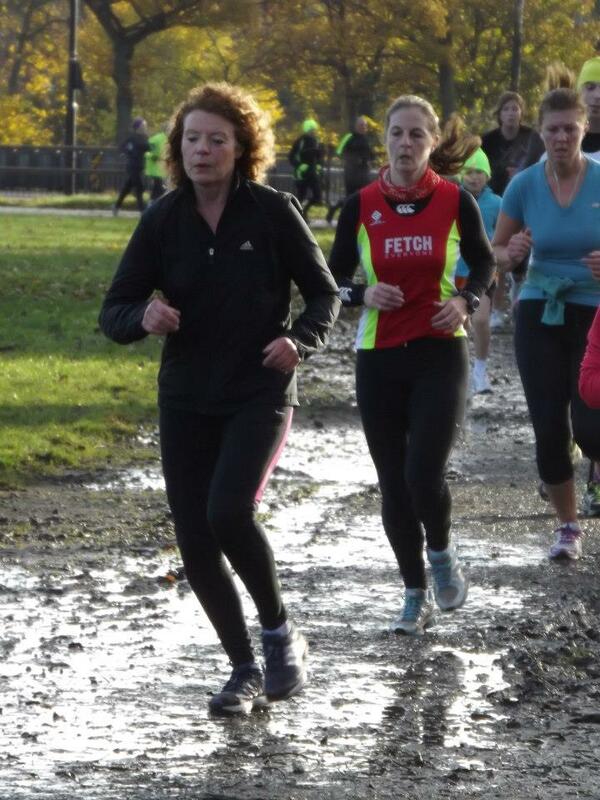 Every week I’ve looked in envy at the pictures from Newcastle Parkrun. I’ve stalked the message board and become a fan on facebook, but I’ve never actually run it until now. Focusing on training for the Great North Run meant that I opted for a long run at the weekend and didn’t want to risk my legs on a short fast blast. But boy do I love a short, fast blast! And I love racing. Even the good natured, just competing against yourself racing of parkrun. It’s suddenly turned to winter here in the North East. We’ve had storms, torrential rain, and today it was cold. Cold on the windswept exposed moor. Bye, bye summer shorts. Hello hoodies, buffs and gloves. But today it had to be my Fetch top. And it was a great race to introduce it. I zoomed into town and headed to Exhibition Park, still keeping my hoodie on, but discarding it at the start as I chatted to Jeff and Rob. I was introduced to the legend that is Mr Henderson senior, still a youngster compared to the other vets preparing to run on some cracking looking legs. I want that to be me, still running and enjoying every minute when I’m in my 80s. Jogging back to the start line, trying to keep warm, chatting with some of the other runners, comparing experiences from last weekend. And then a few quick stretches and trying to keep my legs warm, set the watch and, we’re off! Crikey, they go off like the clappers don’t they? I feel like I’m passed by the whole field by the first turn, and part of me wants to give chase. With one thing and another, I haven’t run since the big race last Sunday, and the adrenaline’s up, but their pace is much too fast for me. Just run your own race I tell myself and start to settle. I really don’t know how I’m going to feel today, shaking off the remnants of a cold and still needing to warm up my legs. But that’s one of the beauties of a first time out on a course, or a distance. No expectations and a guaranteed PB. I overtake a couple of runners as we head out towards the gate, which boots my confidence a little, and I settle into a rhythm that feels tough, but manageable. I can hear my breathing, quite sharp and harsh, and I need to clear my throat a fair few times in the cold air. I’ve forgotten to switch my Garmin back to km splits, but glance at the first marker and see 5.10. Crikey, that’s almost target 10k pace. Keep going girl. The field thins out very quickly and I’m soon in my own space, no one running close behind me and those ahead too distant to target at this stage. I look into the distance and see a ribbon of runners streaming ahead. It feels good to be running again. The 2nd kilometre’s quick too and I overtake a couple more runners as we turn down Grandstand Road. Warmer and more sheltered here, I love running beneath the trees in the dappled sunlight. As we turn in at the next gate, a girl over takes me, but doesn’t sprint away and I think, ‘I’ll have you at the finish’. It’s starting to hurt a bit around now and I ease up a little to get my breathing back into order. I remember this stretch from last year’s 10k over the gravelly path. Then I was desperately hanging on to a runner wearing a Welsh Dragon on his shirt. Today, I’m just running and it feels good – tough, but good. The 4k marker arrives just as I’m starting to drift off the pace a little and I think only 5 more minutes to run and try to push on. But this is a tough bit of the course, into the wind and I don’t seem to make much headway. As the route snakes round and I start to understand where the finish is, I tell myself I’ll push after the last turn, but my legs have other ideas and kick up a gear before it comes. I start to stretch out, making the most of each stride as I start reeling in runners. Pass the girl in the pink top and she’s not coming back at me. That couple up ahead – they’re too far away too catch aren’t they? Legs kick in another gear and the distance closes quickly. Power down, arms pumping. Where is this coming from? I don’t know, but it’s a race and I do like a sprint finish. A quick smile for the camera and over the line in 25.39. Wow! I hadn’t expected that. Head down to catch my breath, and Jeff comes over to say well done. I look up, but can’t reply, and have to put my head down again to get my balance. What a great, exhilarating run. Well it was a guaranteed PB, as I’d never timed myself over that distance before. And it’s confirmed what I pretty much decided in my head after this year’s Great North Run. I’m a speed demon. I like the short fast runs. And although I’d purposefully not set any expectations for myself for that run, after a week shuffling off a cold and no other training. I am very happy with that – particularly as the official time was 2 seconds faster. Here’s what’s on my official Parkrun email: You finished in 88th place and were the 18th lady out of a field of 136 parkrunners and you came 2nd in your age category VW35-39. (OMG 2nd – in my category!) You achieved an age-graded score of 59.14%. The trick now will be to do better each time. But I’m pretty confident I have that in me and it will be great training for the 10k, which will be my next target race in November. All in all, a very good day, topped off by another donation to my Great North Run fundraising for Sands . I’ve just written the cheque for all my offline donations and posted it off this morning, bringing the total raised to £1,375.50. I’m very proud to have done that for Ava and from talking to lots of other people who have been affected by stillbirth or neonatal death, I know it will make a huge difference. So once thank you with all of my heart. Whether you gave money, or just good wishes, you helped me make a difference and remember a little sister with love. I know rest is as important as running, and I did say I was feeling tired yesterday and that maybe running early on a Friday morning after training on a Thursday is not the best idea, but honestly did you see it out there? Sun shining, the merest suggestion of a sea breeze…it was far too nice not to go out for a run. I find it best to have a distance or a time to run in my mind, even when I don’t have it down on a proper training plan. So today I set the target of 5k. I knew once I was off I’d be tempted to do my regular weekend 10k route, but really wanted to try and be sensible. And it was a lovely run. A little bit of a headwind to start, but soon I was into a nice rhythm and flow. I told myself no time targets, but couldn’t resist a sneaky peak at the Garmin’s first beep to see how close I was to my target 10k pace. Not far off and I felt good, so I kept going. I deliberately ran the final half kilometre or so on the beach in a bid to slow myself down and produce a time that I wouldn’t measure myself against in future. Sub 50 10k = 2x sub 25 5ks. Even I can do the maths for that one. But with a downhill slope to the beach and plenty of harder sand to run on, I couldn’t help but pick it up for the last couple of hundred yards to finish feeling out of breath and smiling. Good luck to all of you running far further this weekend. Lots of halfs and marathons coming up. Hope your preparations pay off, your safety pins stay fast and the weather is kind to you.